Ravioles d’escargots au beurre d’herbes. 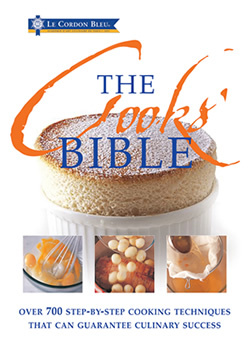 A recipe from Le Cordon Bleu The Cooks’ Bible. Article from FOCUS Magazine – Autumn 12 issue. Make the pasta dough Put the flour and salt in a food processor. Break the eggs into a bowl and whisk them lightly with the olive oil. With the machine running, gradually add the eggs and oil to the flour through the feed tube until a slightly wet, crumb-like dough forms. Turn out the dough and knead and stretch it with the palm of your hand until it is smooth and elastic. Leave the dough to rest at room temperature, covered with an upturned bowl, for about 1 hour. Make the filling Heat the oil in a small pan and sweat the shallots. Add the pastis, stir well and bring to the boil. Remove from the heat, add the snails and let cool. Cut the pasta dough into two equal pieces. Using a pasta machine if available, roll out each piece as thinly as possible to a rectangle measuring 15 x 50 cm. Put one sheet on a work surface, and cut it in half. Evenly space six spoonfuls of the snail mixture on one half of the dough, allowing one snail per spoonful. Brush the dough around the mounds very lightly with water just to moisten. Lay the second half of the dough on top. Press firmly, then cut out fluted rounds. Repeat with the remaining dough and snails. Cover the ravioli and set aside. Bring a large pan of water to the boil. Meanwhile, make the sauce by combining the shallots, wine and vinegar in a pan and reducing until almost all the liquid has evaporated. Whisk in the butter, a few pieces at a time, to form an emulsified sauce. Add the herbs and season with salt and pepper. Keep the sauce warm. Add 1 tbsp salt and a splash of olive oil to the boiling water, then add the ravioli. Cook for 3-4 minutes or until al dente. Remove with a slotted spoon and drain in a colander. 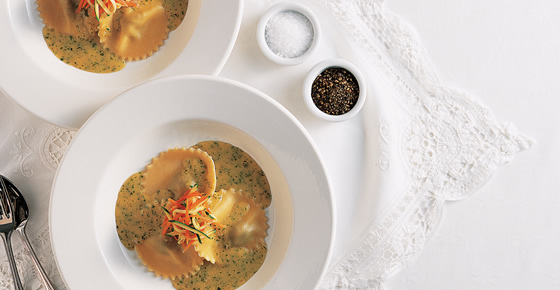 Arrange three ravioli in each of four warmed bowls and spoon over the herb butter sauce. Garnish with carrot and courgette julienne and serve immediately. Cutting Ravioli A ravioli cutter or stamp is the traditional tool for cutting out these stuffed pasta shapes, but you can also use a fluted or plain biscuit cutter. With your fingers, press down firmly around each mound of filling to eliminate any air pockets in the pasta. Stamp out the ravioli shapes with the cutter, taking care to keep the mound of filling in the centre.